The grinding process of the crane rail grinding machine CRGM 1-3 is fully automatic through cable remote control. The ginding angle of each grinding motor is digitally displayed. 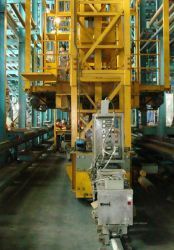 The grinding unit can be adapted with less effort to the trolley travelling winch of the respective crane type. This machine is only available for service.